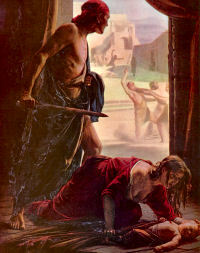 The Holy Innocents saved the Child Jesus from death by King Herod by the shedding of their own blood. 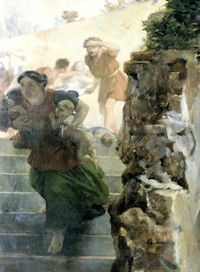 The Holy Innocents are the special patrons of small children, who can please the Christ Child by being obedient and helpful to parents, and by sharing their toys and loving their siblings and playmates. The feast of the Holy Innocents is an excellent time for parents to inaugurate the custom of blessing their children. From the Ritual comes the form which we use on solemn occasions, such as First Communion. But parents can simply sign a cross on the child's forehead with the right thumb dipped in holy water and say: May God bless you, and may He be the Guardian of your heart and mind—the Father, + Son, and Holy Spirit. Amen. Today, dearest brethren, we celebrate the birthday of those children who were slaughtered, as the Gospel tells us, by that exceedingly cruel king, Herod. Let the earth, therefore, rejoice and the Church exult — she, the fruitful mother of so many heavenly champions and of such glorious virtues. Never, in fact, would that impious tyrant have been able to benefit these children by the sweetest kindness as much as he has done by his hatred. For as today's feast reveals, in the measure with which malice in all its fury was poured out upon the holy children, did heaven's blessing stream down upon them. "Blessed are you, Bethlehem in the land of Judah! You suffered the inhumanity of King Herod in the murder of your babes and thereby have become worthy to offer to the Lord a pure host of infants. In full right do we celebrate the heavenly birthday of these children whom the world caused to be born unto an eternally blessed life rather than that from their mothers' womb, for they attained the grace of everlasting life before the enjoyment of the present. The precious death of any martyr deserves high praise because of his heroic confession; the death of these children is precious in the sight of God because of the beatitude they gained so quickly. For already at the beginning of their lives they pass on. The end of the present life is for them the beginning of glory. 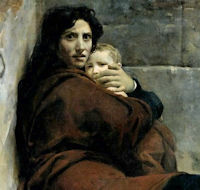 These then, whom Herod's cruelty tore as sucklings from their mothers' bosom, are justly hailed as "infant martyr flowers"; they were the Church's first blossoms, matured by the frost of persecution during the cold winter of unbelief. Read this article by Mgr. Luciano Alimandi on the humility of children.